Mavis never really went away. She’s always been in the mix. It’s just that new generations keep finding ways to discover her. Mavis Staples is the latest in a very long line of legendary artists who get reinvented in the hands of younger admirers. Whether it’s Bonnie Raitt with Don Was, Bob Dylan with Daniel Lanois -- hell, Darren Aronofsky dragging Mickey Rourke out of obscurity to nab an Oscar nomination -- art is handed down through the generations and the payback can win new fans, new vitality, and hopefully a new relevance. The thing is, Mavis never really went away. Through her years with the Staple Singers, her solo career collaborating with Booker T. and the MGs, Bob Dylan, Curtis Mayfield and countless others, not to mention solo albums overseen by everyone from Prince to Ry Cooder, she’s always been in the mix. It’s just that new generations keep finding ways to discover her. Staples’ career was given an even bigger boost a few years ago when her album You Are Not Alone was produced by none other than Jeff Tweedy. The follow-up, One True Vine also featured Tweedy behind the boards. Whether or not the Wilco frontman was the first person to approach a Mavis Staples album with the idea of just letting her just be herself is hard to say, but both albums -- released to critical acclaim and Grammy nominations -- have a down-to-earth feel that give the music a gorgeous simplicity. Staples’ latest album, Livin’ on a High Note, continues in that vein. This time, M. Ward is the producer, and that’s a good sign, seeing as how his overall sound isn’t exactly light-years away from Tweedy’s. Predictably, he keeps things simple, with warm instrumentation and an uncluttered approach. It’s inevitable that comparisons will be drawn between this album and the previous two, but I’ll save you a lot of time: if you liked the others, chances are you’ll like this one as well. If anything, Livin’ on a High Note, true to its title, is a slightly rowdier, more upbeat affair. While Tweedy’s productions were a bit more hushed and sober, Ward brought the party in 2016 (which is odd, seeing as how I can’t for the life of me picture M. Ward whooping it up, ever). Being a Mavis Staples album, it’s not enough to bring the funk and preach peace and love -- she’s also a gospel singer. 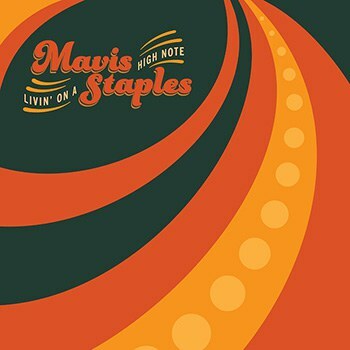 So while it may seem odd having the dark, Gothic presence of Nick Cave on a Mavis Staples album, his beautiful “Jesus Lay Down Beside Me” is an eloquent, hymn-like song of consolation, perfect for Staples’ gospel pipes. Livin’ on a High Note is nothing if not eclectic. While the focus is on an upbeat good time, peppered with a few life (and history) lessons, the quietest, most reflective song closes the album beautifully. The music to “MLK Song” was written by M. Ward, with lyrics drawn from Martin Luther King, Jr.’s “Drum Major Instinct” speech. “If I can help somebody as they pass along / If I can cheer somebody with a word or song / If I can show somebody that they’re travelling wrong / Then my living will not be in vain.” Staples sings these words, accompanied only by an acoustic guitar, as an affirmation. She may be livin’ on a high note, but she never forgets her personal set of values.